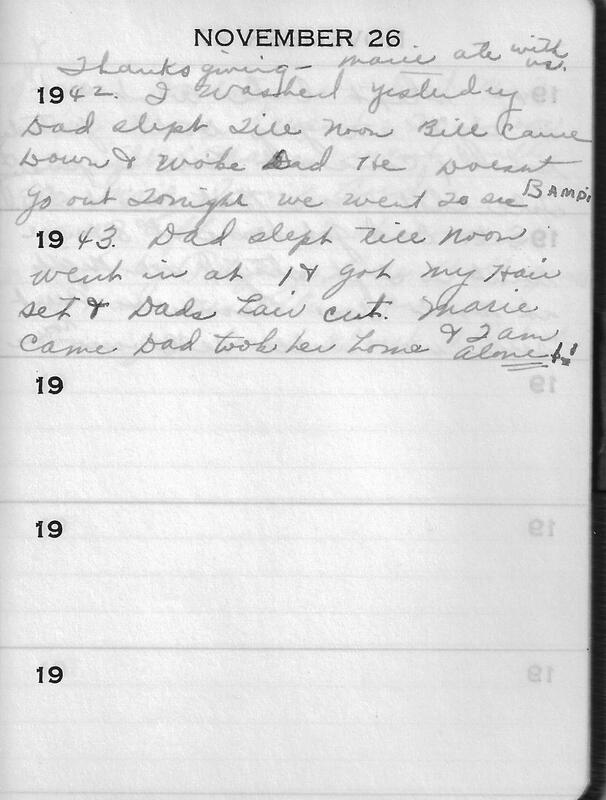 1942 – Thanksgiving – Marie ate with us. I washed yesterday Dad slept Till Noon Bill came Down & woke Dad He Doesnt go out Tonight We went to see Bambi. 1943 – Dad slept till Noon Went in at 1 & got My Hair set & Dads hair cut. Marie came Dad took her home & I am alone!! I love that she reports that they went to see Bambi in the 1942 entry. It was originally released on August 13th of that year. I love the image of the two of them sitting in the movie theater watching a movie that I loved as a child. I wonder why she made a point of her being alone in the 1943 entry? Her children are grown and her husband works. Something else must be going on. This entry was posted in Tennant, Wright and tagged Bambi, genealogy, Martha Marie Tennant, Martha Marie Wright, Martha Marie Wright Tennant, Martha Tennant, Rene Baron, Sylvia Rene Stevens. Bookmark the permalink. Dang – movies don’t stay in the theater that long anymore. That’s like Planes or The Butler still being in the theater right now!